Fluffy and salty with aromas of olive oil and fresh herbs, focaccia is a true all-purpose bread. Great by itself as a snack, it can stand in for dinner rolls, or be used as a base for a variety of casual appetizers. Split horizontally, it makes wonderful sandwich bread, especially with hearty meats. In a large bowl of a stand mixer, add the yeast and water. Stir in 1 teaspoon of the honey and let stand until the yeast softens and bubbles, about 5 minutes. Mix in the remaining honey, 4 tablespoons olive oil, and salt. Add 5 cups of the flour and beat with the paddle attachment on medium speed until dough is elastic and pulls away from the sides of the bowl, about 5 minutes. Stir in about ½ cup more flour to make a soft dough. In a stand mixer, with a dough hook attached, knead until smooth and elastic, about 15 minutes, adding just enough flour to prevent the dough from sticking. Place the dough in a large greased bowl, cover and let rise until doubled in volume, about 1 hour. Punch down the dough. Cover with the inverted bowl and let rest for 10 minutes. Divide the dough in half. Roll and stretch each portion into a rectangle. Place on a quarter-sheet pan. Dimple the dough and brush with the remaining 2 Tbs. olive oil. Let stand until dough looks puffy, about 15 minutes. Position oven racks in the top and bottom thirds of the oven, and heat the oven to 425°F. 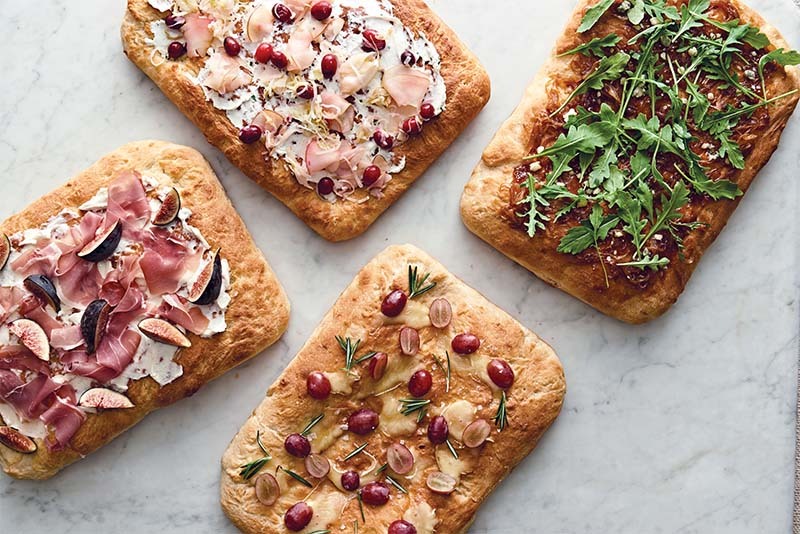 Bake the focaccia until golden brown, 15 to 20 minutes, switching the pan from top to bottom racks halfway through baking. Top and cut as you’d like, and serve warm. Top the baked focaccia with sliced Taleggio (it’s fine to include the rind), halved grapes, olive oil, fresh rosemary, and flaky sea salt. Broil until the cheese is melted and browned. Spread a light coating of fig jam on the baked focaccia and top with caramelized onions and a smattering of Gorgonzola. While broiling the topping, toss arugula with a squeeze of lemon and just enough olive oil to coat it lightly. Pile the arugula on the focaccia and season with salt and pepper. Sauté sliced leeks, sliced apples, and cranberries in plenty of butter; season with salt and pep-per. Season soft goat cheese with salt, pepper, and chopped fresh herbs. Spread the goat cheese on the baked focaccia and top with the leek mixture. Combine goat cheese and honey and spread over the baked focaccia. Add very thin slices of prosciutto. Arrange sliced figs on top. Broil for 2 to 3 minutes to caramelize the figs and crisp the prosciutto’s edges. Recipe created in partnership with Fine Cooking. I don’t have a stand mixer. Are there alternatives? You can always knead the dough by hand – just go by how the dough feels rather than base it on a set time. More information on kneading can be found in our Baking Steps Guide: https://redstaryeast.com/yeast-baking-lessons/baking-steps-guide/. Would you please help me with this problem for me, I live in Mexico City and bread flour is not sold. We can only find common flour. Can I use it or what do I have to do, maybe add something as gluten. Thank you for your help. Yes, you can add 1 tsp of vital wheat gluten per cup of all-purpose flour.